It attacks rapidly, leaving very little time for counterattacks. Use magic to limit its movement. When it unleashes its relentless tackles, use reaction commands to get through it! 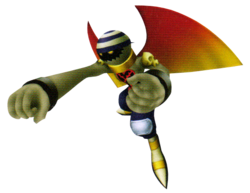 The Aerial Viking is a variation of the Air Pirate Heartless; it appears only in Kingdom Hearts II Final Mix. They are only found in the Cavern of Remembrance, and they are much more powerful than the original. An Aerial Viking is a humanoid Heartless with a tan body and large, orange and yellow wings on its back. It wears brown bracelets on each of its wrists, a skull on each of its shoulders, acting like a pauldron, navy blue pants with blue-white patches on the knees, and yellow and white striped boots. It also sports a gold choker and a black face with glowing yellow eyes partially obscured by a blue and white striped bandana. Its Heartless emblem is on its chest. The Aerial Viking's name reflects its flying abilities, as well as Vikings, Norse warriors and pirates.